At Stake: FAO looks to agribusiness for policy guidance and looks away when agribusiness practices harm peasant agriculture. Simultaneously, CGIAR’s management is either ignorant of – or condones – Centers’ privileging corporate access to CG breeding lines and publicly-held germplasm. At risk is the public policy credibility of FAO as well as public control of the almost $700 million CGIAR budget. The spill-over from this conflict of in terest jeopardizes all the Rome-based Agencies (RBAs) and the UN’s premiere Committee on World Food Security. Actors: Trade association lobbyists and agribusinesses (Nestlé, PepsiCo and SABMiller, for example) are hiring their own agronomists – by the hundreds – to work directly with farmers in the global South to get the products the companies want and under conditions they dictate. As companies move upstream, they have a new interest in agricultural policy and research into plant varieties that may help them safeguard their raw material supply despite climate change. Simultaneously, FAO and some CGIAR Centers, such as ICARDA and ICRISAT, are adopting private sector culture, under pressure from big foundations and OECD governments, in order to appear “market-friendly” and to attract funding. Fora: The Bill & Melinda Gates Foundation is expected to announce plans for an evaluation of the Rome-based Agencies. An evaluation would be appropriate if it is conducted by the UN Committee on World Food Security and guided by smallholders and governments. The CFS should also conduct an evaluation of the role of private institutions including the impact of trade association lobbyists and big foundations like the Gates and Syngenta Foundations. The CFS will meet in Rome in October. The CFS, as an intergovernmental body, has special rules to ensure the active participation of smallholder producers, concerned civil society and agribusiness, as well as governments. It is also the one forum where the Rome-based agencies – FAO, IFAD (International Fund for Agricultural Development), WFP (World Food Programme) as well as CGIAR (through Bioversity International) – report. 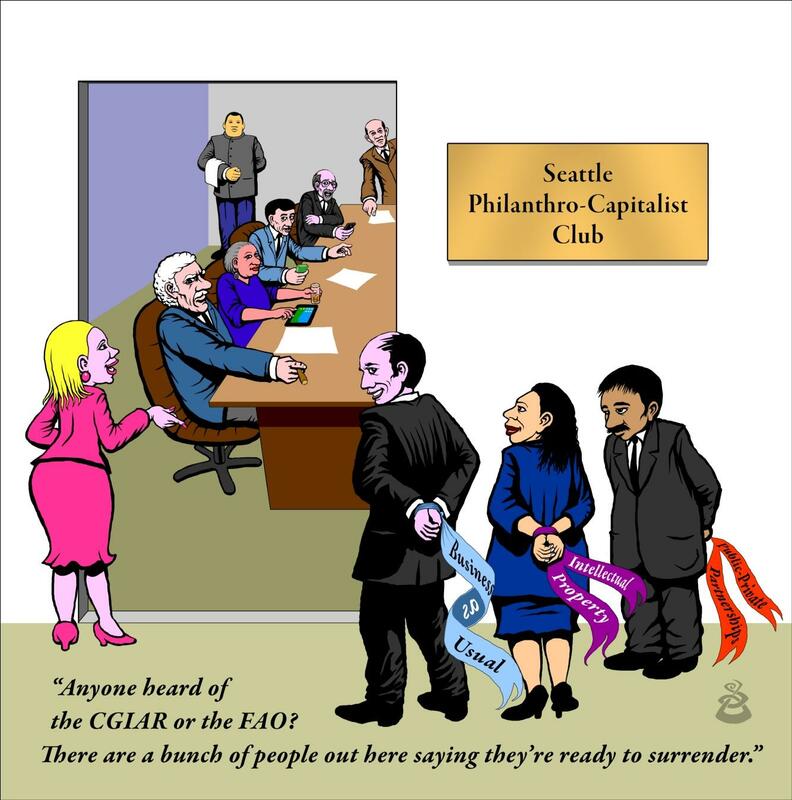 The CGIAR should review its private sector policies when its funders group convenes with the Gates Foundation in Seattle March 6-7, and the FAO Council should do likewise when it gathers July 9-13. This could also be a discussion topic when FAO’s brand-new Director-General sits down with the UN’s Special Rapporteur on the Right to Food January 9-17. Policies: As the only UN forum that brings together all the international foodies, the CFS must be strengthened, become more independent of FAO, and develop an agenda that protects public institutions from private interests. Guided by the FAO International Treaty on Plant Genetic Resources for Food and Agriculture, CGIAR must prohibit privileged access to its advanced breeding lines and, protect publicly held germplasm. Legal control of CG gene banks should be surrendered to FAO. FAO should critically review its policies and practices regarding private sector involvement and submit its report to the CFS. It was with great sadness that ETC Group learned of the passing of Dr. Erna Bennett at the beginning of this year. Erna was a passionate, Irish revolutionary and world-renowned plant geneticist as well as a founding board member of RAFI (now ETC Group). She worked at FAO from 1967 until 1982 when she was forced to leave because of her strong support for FAO’s general and program staff unions as well as her vocal and unrelenting campaign to keep corporate interests outside the UN system. While we’re not in the custom of dedicating our work to individuals, ETC Group dedicates this Communiqué to the extraordinary life and memory of Erna Bennett, whose passing comes 30 years after her departure from FAO and at a crucial moment in the battle she so effectively waged against the privatization of plant genetic resources.